For the first time, the Illinois Law Enforcement Torch Run has added an Athlete Liaison to the State Committee. Special Olympics Illinois athlete, Rikki Kirsch of Shorewood, proudly joins the group. She has competed in Special Olympics for many years in several sports ranging from equestrian to golf. 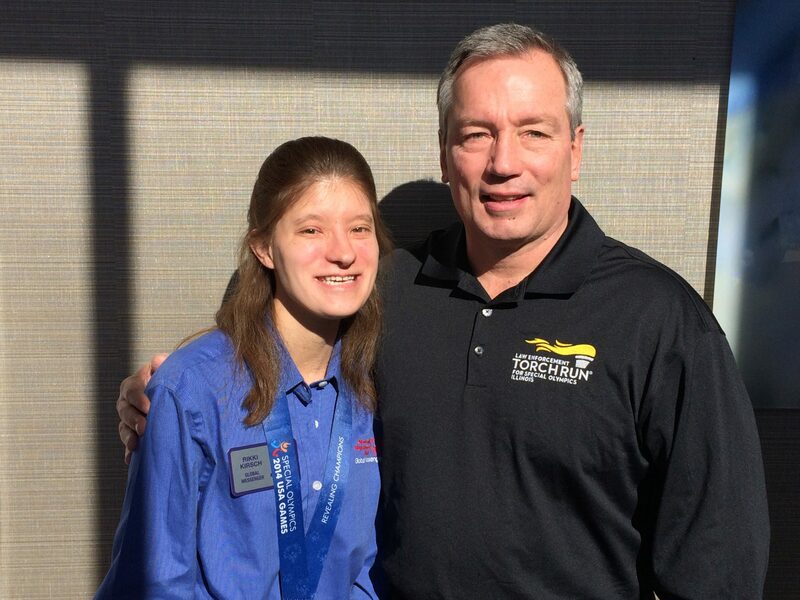 Rikki attended the 2014 Special Olympics USA Summer Games in New Jersey where she represented Illinois in aquatics. This year marked her first time competing in the State Winter Games and she took home gold in snowshoeing. Since becoming a Global Messenger, Rikki officially met all the qualifications to become an athlete liaison. She was nominated by multiple people and came highly recommended. “Having Rikki involved with the Torch Run committee is one of the reasons Illinois has such a successful program and is respected worldwide,” says Torch Run Director and Chief of the Westchester Police Department, Steve Stelter. The Athlete Liaison is a Special Olympics Illinois Athlete whose primary responsibility is to represent the interests of all Special Olympics Illinois athletes on the LETR State Committee. Steve Kirsch recently retired as Deputy for the Will County Sheriff’s Police Department. He, along with his wife Chris, were the first LETR Family Liaisons and serve on both the Family and LETR State Committees. “For Steve and me, being a part of the Torch Run is like family get together’s. We got more involved because of the amazing changes for Rikki and we wanted to give back,” explains Chris Kirsh, Rikki’s mom. Rikki’s term began January and she will serve on the committee for two years. “It’s FUN! I like to be even more involved with the Torch Run events statewide,” says Rikki. Rikki’s responsibilities include promoting Torch Run programs and events to other Special Olympics Illinois athletes, assisting in the recruitment of Special Olympics Illinois athletes for participation in LETR events and attending monthly Torch Run State Committee meetings. You will likely find Rikki at LETR events throughout the year like the Dunkin’ Donuts Cop on a Rooftop this May and at Summer Games in June. “She loves being with the officers and thanking them personally! She gives the officers a face for the Special Olympics athletes that benefit from their hard work and commitment,” says Chris. Special Olympics Illinois is proud to have Rikki represent the athletes on the Torch Run State Committee.